Every family has their own special way to recharge and unwind after a long day. 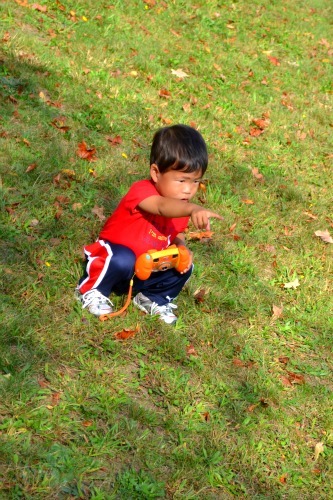 Our family tends to gravitate towards the outdoors. The sunshine, the soft breezes, the gorgeous trees, and clouds are what not only draws us to nature, but also helps us disconnect from our hectic lives to focus on what is really important – family. There’s just something about being outdoors that makes it easier to connect with each other. 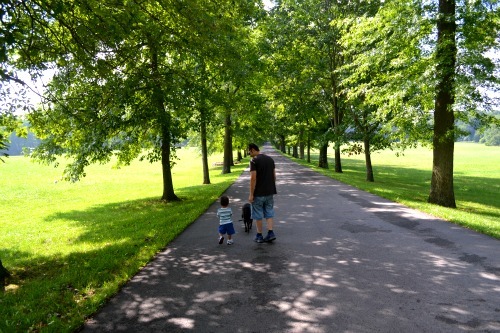 Most days we choose to simply take a nature walk as a family, which may lead us anywhere from around the neighborhood or even to the mountains not far from where we live. Family walks can be so inspiring, if you only take the time to stop and allow nature to guide your journey. Sometimes just the simple act of talking about your day during your walk can fill your evening with joy. However, you can always choose to take it a step further if you have the extra time by collecting or capturing items that you see along the way. Here are four ways that our family tries to embrace our nature walks together and allow the elements to filter into our activities even after our treks are complete. 1. Art ~ There are so many loose items outside that you and your little ones can transform into special works of art. If you live near a beach, gather shells to create your own wind chime or sand to color and sprinkle on a picture made with glue. Go on a treasure hunt for unique tools that you can paint with, whether it be a leaf, flower, or even a twig and the create a masterpiece. 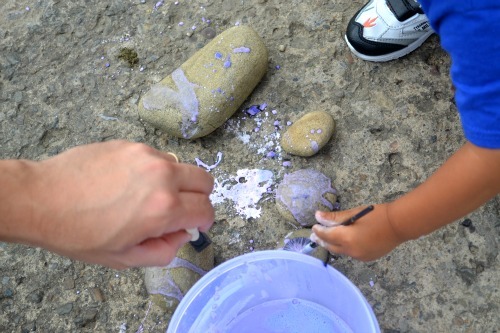 Collect a bag of rocks during your hike and then paint them using chalk or finger paints. 2. Discovery ~ There are always so many things to see outdoors even if you travel the same road every evening. Insects that are living underneath and rock, various flowers that are blooming just around the corner, or exciting shapes that take form in the clouds above you. With toddlers and small children, everything is new and exciting. Allow them to touch and experience those items with new eyes. Encourage them to pull apart a flower to explore all of the parts that make up that sweet smelling blossom. Ask them to sort the items that they collect based on color, texture, or some type of classification. 3. Respect and Appreciation ~ As parents, we feel it is so important to instill a sense of appreciation and respect for the environment and elements of nature in our children. While you are out and about, talk about all of the beautiful sights you are seeing like butterflies, the different colored leaves that are changing, the puddles on the sidewalk. Encourage them to touch what they see, to listen, to smell. Go on a sound hunt. Take pictures of items that they think are important and start an album or nature journal. 4. Experience the Seasons ~ Walk barefoot in the grass during the summer. Jump in puddles during your walk in the spring. Crunch in the snow during the first snowfall of the winter and enjoy the leaves as the begin to change. You can gather bits that are special the season you are experiencing at the moment to create your very own nature table. 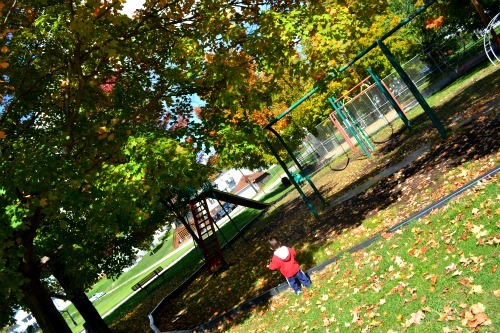 Just last week my family decided to explore a new park where the leaves were starting to change colors and fall to the ground. We gathered up several of them with such vibrant colors and decided to preserve them in some way. When we got home, we saw a pumpkin from our garden and wanted to try our hand at decorating it with those colorful leaves. 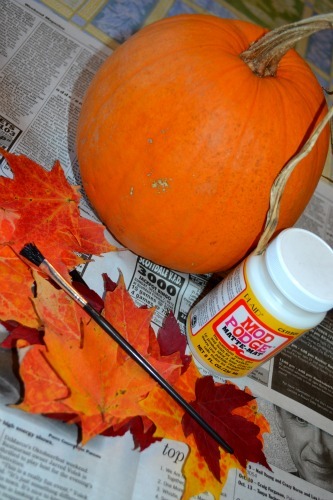 All that we used were the leaves, paintbrushes, a pumpkin, and glue (like Mod Podge). 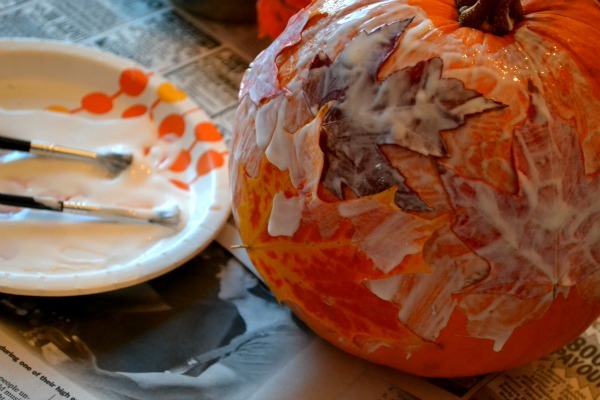 We took turns painting the pumpkin with glue and arranging the leaves as a collage on the surface. Once they were placed in the position that we wanted, we painted them again with the Mod Podge to seal in the color. The end result was amazing! Now we have a beautiful display for the fall season that will remind us of our family walk at the park. Whatever you decide to try outside, be sure to try it out as a family. Set aside one at least one day a week that is carved out especially for family walks. Try to go outside as soon as dinner is complete or first thing Saturday morning. 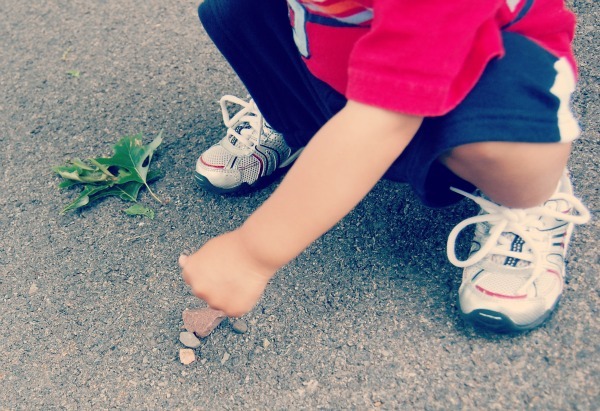 Allow the children to come up with a project that they would like to explore with the items found in nature they collect. Sit around the table the next evening and make it a family project. Work together, talk, listen, and create those everlasting memories that your children are sure to remember for years to come. Think about the seasons and let them guide your discovery. Gina is a former elementary school teacher, turned stay-at-home mom to an adventurous 2 year old. She and her husband try to create an atmosphere in the home that fosters strong family connections through guidance and inspiration. You can read more about their family fun at her blog, famiglia&seoul or by visiting her Facebook page. Great post, so easy to forget about the simple things these days, and they are what kids love the most. Love your pumpkin too, it looks great!! The pumpkins with leaves on them on fabulous! I am going to do this over the weekend. 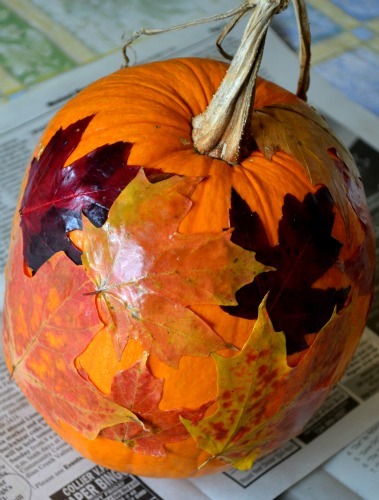 I know my kids would love gathering leaves and then creating leaf-covered pumpkins. I love simple yet gorgeous activities like this! Thanks for sharing.